I suppose this story started a month and a half ago while we were looking for a new place to live. It goes without saying that housing in LA is...expensive. We'd been living in a guesthouse since we married and really valued having outdoor space of our own. So we found ourselves scouring the rental listings for other such set-ups. To no avail. For indeed, I have reached the point in my adult life that kitchens need to be bigger than hot pads, master bedrooms need to be bigger than queen sized mattresses, my husband needs to be able to stand up straight in the bathroom, etc. So on a Thursday we'd just about given up on the guesthouse option and spent the day looking at apartments. There was one more guest house that we were going to check out, but the rent was relatively cheap and it was right next to I-10 so we didn't have very high expectations of the place. At 2pm we met the landlord to tour the place. He took us through a gate to the right of the main house and down some brick stairs that opened up on a terrace that overlooked Culver City. The property is on a number of tiers so down some more stairs we went, to a pool and then finally to the place he'd listed for rent. The front was all windows and it was cut into the side of the hill. It had a gated patio/terrace that is half covered. The stairs continued down to a yard and garden area. We couldn't sign the papers fast enough. The place is not without its...quirks. There isn't a single 90 degree angle in the whole place. The kitchen is a glorified hallway. There are random pillars in the living room and the bedroom, support structures for whatever this used to be. During Jake's 3am feedings, I hear mice running around above us. And the list goes on. But we're used to critters and to managing in unusual/tiny places, so we weren't too phased. And Jacob enjoys all the opportunities to use his tools. One of the projects that Jacob took on was installing a vent in the bathroom which was tricky. When my Dad was in town they talked through the project, specifically the electrical side of it, which would involve a three-way switch, I have no idea what this is, but from the way Jacob has talked about it, it might as well be the electrician's Everest. Anyhow, beyond the infamous three-way switch, this little project also involved a hole in the ceiling above our stove. Life being as it is, the hole gaped down at us for several days as the vent-saga continued. One specific night, around 11, we'd only just gone to bed, Jacob was already asleep and I was feeding Jake, and I heard a noise in the kitchen. I thought most likely the precariously perched dish in the sink had finally toppled over or something like that, but it had certainly sounded like something hitting the stove. Then I remembered the hole. I contemplated waking Jacob to go check it out. I did, and I justified it because he was snoring. So I nudged him and said: "Do you think it's possible that a mouse could fall out of the ceiling onto the stove?" His sleepy eyes looked up at me, annoyed and very confused. I realize now that a hypothetical question at such a time didn't really serve, but I obliviously repeated it. Still sleepy confusion. I finally just said: "I heard a noise in the kitchen." This roused him enough to huff out of the room in order to put his sweet, little, nursing-the-baby wife at ease. A few minutes later he returned and told me that there was a baby possum on the stove. Below is a video. Sorry for the Blair Witch feel to the filming, for some reason we didn't think to turn the lights on. 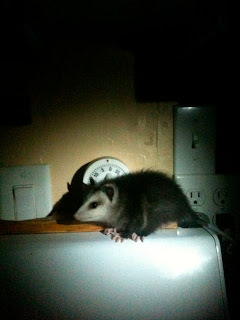 After this little event, Jacob temporarily plugged up the hole over the stove to ward off the rest of the possum family, and we got back in bed. It was all just funny until Jacob mentioned that baby possum was probably going to die outside. This was troubling. I didn't like thinking we'd sent this innocent little night-walker to its demise. Jacob said it'd probably never been out of the ceiling and guessed it was about a month old. This really got me. "So...it's the same age as Jake...?" I said, as my postpartum self got a little teary. Jacob looked at me in disbelief. "You want me to go get it and put it back in the ceiling?" "No...I don't know..." I replied. So we sat there determining our moral obligations...this took about as long as remembering what an adult possum is like, at which point we decided baby possum was spending his first night outside and went to sleep. In the morning he was nowhere to be found. So there's my little story. For those of you who came here looking for more pictures of baby Jake. I'll get some up ASAP. Ciao for now. oh wow! jealous of the sound of your new abode! Awesome! and the possum...gross. you are too kind to be worried about his/her well being! I hope all is going well with your little cub..the first several weeks were wonderful but a t-r-a-n-s-i-t-i-o-n for the likes of my newby mom self!